I am 85 and ever since I can remember I have had a full bodied male brass and tin doll. The entire body is tin and the arms and legs move. The tension on the arms and legs seems to be held together with a coil spring. The front half of his face is brass. There are no manufacturers markings. 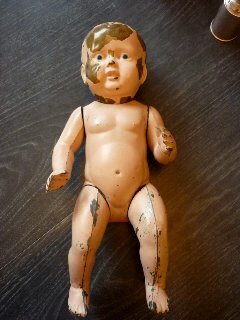 I have seen a lot of dolls with tin heads and cloth bodies, but no others like this one. Some paint on his face is worn off, but originally he was painted Caucasian flesh tones. The leg halves and arm halves are soldered together. Do you know from where he might have originated? I have emailed a picture of my doll. I am not sure if anyone can see it but I hope you can. That will help you help me know more about this doll. Without pictures, it is impossible to assist in identifying a doll.